Finding A Place For President Polk's Body To Truly Rest In Peace The body of former President James Polk may be on the move again. He's been buried on the grounds of the Tennessee state Capitol, but there's discussion about moving his remains to his former home. 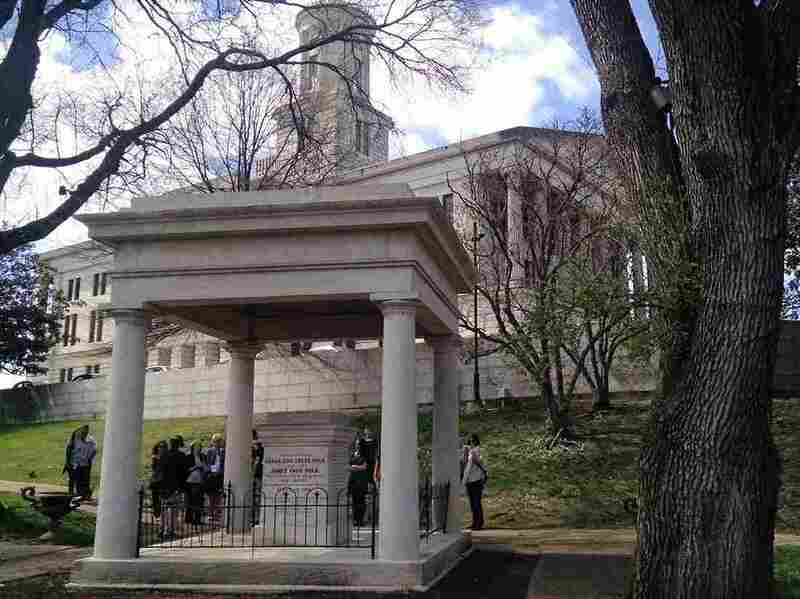 A tour group visits the tomb of President James K. Polk and his wife Sarah Childress Polk on the grounds of the Tennessee State Capitol. Of all the men who have been U.S. president, just one is buried on the grounds of a state capitol. But that might be about to change. Lawmakers in Tennessee have taken the first step to exhume the body of James K. Polk, who for a century has rested in a small, white, chest-high tomb with his wife, Sarah. Teresa Elam remembers picnicking here with her grandfather, just downhill from the Tennessee Capitol. "And so I did that with my children, and now we're doing it with our grandchildren," she says. Elam claims to be a distant relative of the nation's 11th president — a niece, seven generations removed. In his single term, Polk took control of the Southwest from Texas to California, established the Smithsonian Institution and the U.S. Naval Academy, and reorganized the Treasury and postal system. Elam believes his body should remain here. "I just have a lot of bad feelings about disturbing the grave," she says. "But also, taking him out of Nashville, which he truly loved. In his will, he wanted to stay here." Well, it wasn't here precisely. It was actually about 400 yards away. And therein lies the dispute. Perhaps no president has had his remains fought over more than Polk. He passed away in 1849 just months after leaving the White House, and from the beginning, his wishes were ignored. Because he died of cholera, he received a quick burial in a city cemetery for sanitary reasons. The next year, Sarah Polk insisted he be moved to their Nashville home, Polk Place, as stated in his will. He lay there until after Sarah's death in 1891. With no direct heirs, a judge divided the estate, leading to Polk Place's demolition and the tomb's relocation. "I don't know that we're taking an honor away, and I would agree it is an honor to be buried at the Capitol, but it's a little bit difficult to get to," says Thomas Price, the curator of the James K. Polk Home and Museum in Columbia, Tenn.
Price says he wants the tomb moved an hour away, to the only home still standing where Polk actually lived. "Like the Capitol grounds, we're a state historic site," he says. "Like the Capitol grounds, we're a national historic landmark. We've been open to public since 1929 with one goal: to perpetuate the memory of the 11th president." Price argues Polk didn't intend so much to be buried in Nashville as to be laid to rest at his residence. Andrew Jackson's grave at the Hermitage and George Washington's grave at Mount Vernon would've been templates. The Tennessee Senate has approved the moving of Polk's remains. But the state House, the governor, the Historical Commission and the courts still have to sign off, setting up what's likely to be yet another protracted debate over where he should finally rest. Chas Sisk is a reporter with NPR member Nashville Public Radio. You can follow him @chassisk.